Oscar selfie shows movie stars, front row, Jennifer Lawrence, Meryl Streep, Ellen DeGeneres, Bradley Cooper and Nyong'o's brother Peter, and back row, Tatum Channing, Julia Roberts, Kevin Spacey, Brad Pitt, Lupita Nyong'o and Angelina Jolie. It was the talk of the Oscars 2014. Not whether '12 Years A Slave' was a better film than 'Gravity', or how it was that 'American Hustle' got no gong at all, or if Leonardo DiCaprio will ever manage to win one. 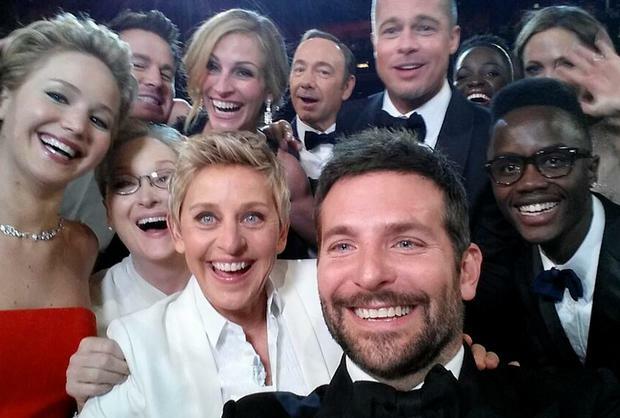 No, it was a selfie – possibly the "most famous selfie in the world". Certainly, it lived up to that billing, featuring as it did a clutch of some of the most famous actors in the world – Meryl Streep, check; Julia Roberts, check; Jennifer Lawrence, check; Brads Pitt and Cooper, double check; Kevin Spacey, check; Channing Tatum, check. And then, the finishing touch: squeezing into shot along with these A-listers, an unknown young Kenyan. He turned out to be the brother of Lupita Nyong'o, who won the award for best supporting actress for '12 Years A Slave'. Commenting later on her sibling's unexpected star turn, she said: "I think that's his win for sure. He got into the most famous selfie in the world. I'm glad I could have facilitated that." It may seem odd that a poorly framed, slightly blurry, group portrait taken on a smartphone should have generated more buzz than the Oscars themselves. It was engineered by Ellen DeGeneres, the host of Tinsel Town's annual star-fest. She had joked early on in the evening how she wanted to create the most popular selfie of all time at the Oscars. So when she stepped off stage – wielding her phone or to be technically correct her "phablet", she headed for the most nominated Oscar actor of all time: Meryl Streep, who has 18 nods to her name. Streep giggled and acquiesced. Within seconds, DeGeneres had hustled in other front-row luminaries, capturing a snap of a Hollywood elite, with 10 Oscars. Then, DeGeneres tweeted the picture. Within a few hours it had been retweeted by more than 2.5 million people, creating a new record for the microblogging site. In truth this selfie was stage-managed by Samsung, one of the sponsors of the Academy Awards ceremony and a company keen to overtake Apple in America. Eagle-eyed viewers would have spotted DeGeneres's device was a Samsung Note 3. Even sharper viewers would have noticed that in shots taken backstage she had reverted to her iPhone.